This is a labour of love - and a fair amount of insanity. 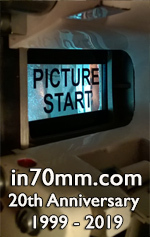 The history of one of the most remarkable film projectors; the DP70 Todd-AO projector. In 1982, as a teenager, I started my film-life as a projectionist apprentice at the 3 Falke Bio, my favourite cinema which was "purpose built" for Todd-AO in 1958. My new interest became the history of the Philips DP70 projector. I was intrigued and wondered "Why did the DP70 receive an OSCAR and what was Todd-AO?". My collection of DP70 information started to build and soon I discovered how much the DP70 was appreciated everywhere. I also discovered the wonderful story about Todd-AO and have spent a lot of effort and time to document the Todd-AO process and the DP70 projector. I remember finding the original European DP70 Brochure (PDF) of the DP70 with a list on the back cover of all DP70 installations by August 1960. I started to collect DP70 serial numbers from Copenhagen, and soon expanded the search to Denmark and soon to Malmø in Sweden and in Hamburg in Germany. Just how many machines were made? An intriguing question which I have tried to answer with this list. I wrote letters to cinemas and soon answers arrived with serial numbers and pictures from fans all over the world. This was amazing! The list grew and I sent out regularly updated lists to all contributors in return for their help. Today, nearly 35 years later, the lists are too long to do that, and instead you can find the information online. It is very difficult to record all DP70 cinemas and serial numbers. 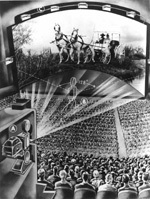 Projectors are moved and often re-installed in new places. Cinemas open, close and sometimes the machines are destroyed when cinemas are demolished. When available those details have been included on the cinema lists. 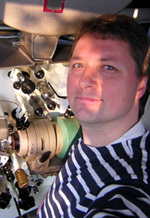 Little did I know, so many years ago, what this interest and lifelong hobby, would bring me of wonderful visits to projection rooms, cinemas and unique historical places connected to the DP70 story. Imagine the thrill to receive a letter from The Todd-AO Corporation in Hollywood with serial numbers and images of their machines. What a joy to find 24 machines in one single day in the projection rooms of Paris - and by the end of the day be able to say "70mm" and "DP70" in French - fluently. I have traced the story back into the home town of the chief engineer, met his son, shared memorabilia and information. I have seen the birthplace of the DP70 and photographed the Academy Award Jan Jacob Kotte won in 1963 for his achievement. I have seen American Optical in Southbridge in the United States, the birthplace of Todd-AO, and met with several key people from the early days of Todd-AO.